Are Teeth Whiteners Worth the Cost? En español | Americans pay dentists about $140 million dollars a year to whiten their teeth, according to a study by the American Academy of Cosmetic Dentistry. And it's not surprising that most of the men and women spending this money are boomers. Indeed, the demand for all types of cosmetic dentistry — getting straighter, whiter teeth — is driven by "this generation's interest in a more youthful appearance," says Hugh Flax, president of the American Academy of Cosmetic Dentistry. Americans also spend millions more on over-the-counter teeth whiteners. So what works best? What costs most? And what's best for you? Here are some facts to consider. No kidding. Strawberries and some other items in your fridge can brighten your smile. All whiteners work in the same way: They use carbamide peroxide, which breaks down into hydrogen peroxide on the teeth. The hydrogen peroxide then breaks down larger molecules on the teeth into smaller ones, which reflect more light, says Michael Apa, a New York City restorative and aesthetic dentist. The whiteners work well on superficial stains caused by coffee, tea, blueberries, red wine, smoking and aging. They do not work on teeth that have turned gray from the inside out, as sometimes happens when people take large doses of tetracycline, for example. The main difference between various types of whiteners is the level of peroxide used: Dental office applications often contain around 30 to 35 percent peroxide; the dentist may send you home with custom molds and solutions to use — with their supervision — that have a 10 to 15 percent concentration of whiteners. The over-the-counter kits you can buy, which carry the American Dental Association's seal of approval, contain 10 percent carbamide peroxide. But dentists use whiteners with higher concentrations because they work faster and some whitening can be done in as little as one sitting, as opposed to weeks of applications. However, a product with a higher concentration also increases the risk of gum burns, which is why it needs professional application or supervision. Some dentists are now offering laser whitening, which avoids the mess altogether. Bleaching can cause tooth sensitivity: Think of that ache you get when eating really, really cold ice cream. "Usually, most of the sensitivity goes away after a few days. If it doesn't, you may need help from a professional dentist who can put a coating on teeth," says Mark Wolff, a professor and associate dean at the New York University College of Dentistry. Be forewarned, however: Sensitivity sometimes can be difficult to eliminate. And the cost can range from a few dollars for a couple of tubes of toothpaste for sensitive teeth to several hundreds of dollars for sealants. If you have sensitive teeth before you start the process, go to a professional. You may have dental problems that need to be addressed first. No whitener is permanent: The whiteness you get from a treatment in the dentist's office may be more thorough, but it lasts about as long as the whiteness from an over-the-counter regimen, says Wolff. How fast your teeth become stained and discolored, he says, depends on your diet and medications. If you drink and eat foods that leave stains — from red wine to blueberries — stains will reappear faster and your bright white teeth will fade. 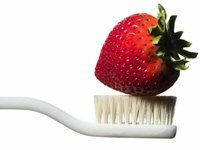 If you are careful and limit these foods and liquids, your brighter teeth should stay that way for about six months. Weigh the differences in procedures: Should you choose a visit to the dentist's office or an over-the-counter whitening product? It depends. "Often, over-the-counter teeth-whitening trays do not fit properly, which may cause the gel to leak," says Flax, of the American Academy of Cosmetic Dentistry. He says that whitening strips can slide, "getting acid on your gums." If you are starting with sensitive teeth, a dentist can offer more comfortable whitening processes. And if you want a quick fix, going to the dentist is a speedier way to whiten teeth. On the other hand, "at-home whitening trays have worked well for more than 20 years," says Flax. Wolff points out that while the strips are effective, the trays do work better if applied correctly. Costs: Laser whitening will run around $1,000; a bleaching application in a dentist's office costs about $500. If the dentist does an initial bleaching and then sends you home with a kit to use, expect to pay around $300. The costs of over-the-counter whitening kits can vary widely — from $30 to $300. Don't be snookered into the more expensive products, says Wolff. "Consult your dentist first before putting out that kind of money on an over-the-counter product."